I don't know why it has taken me so long to jump on Digi stamp band wagon, but now I have I think I am hooked, it is such a cheap way to get your images. This is the very first one I purchased. It is from KennyK downloads. 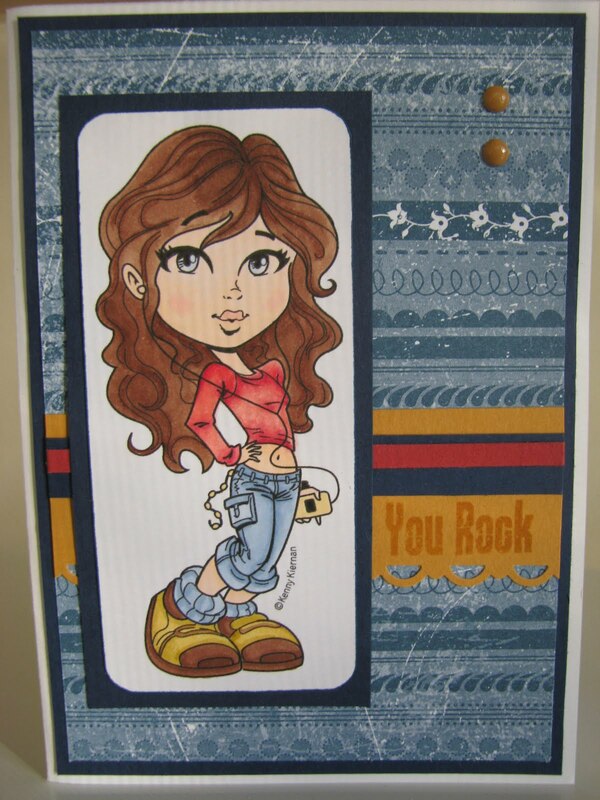 I have coloured her with my copic markers, which I am off now to order some more, (so addictive!! they are dangerous!!) lol. Sorry about the picture with the funny little lines on it, but it is very windy out side so I had to shot it inside and believe it or not the lines are from the fly screen on the window, but it is the only bit of sun I could find. 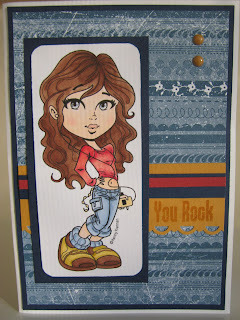 I have backed her with some Blueberry Crisp DSP from Stampin' Up! and used More mustard, Night of Navy and Riding Hood red. Woohoo go you with your copics (hmm put through a rather large order myself the other day). Gorgeous image (I haven't jumped on the digi wagon yet either) and you've coloured her so beautifully. Lol at you trying to get a decent pic, this one turned out good, you obviously found the right spot and had you not mentioned lines I wouldn't have noticed. She looks FAB, such a great card. I have quite a few Digi images I should use more, then again I have loads of stuff I should use more. You are doing an awaesome job with the copic colouring, I think I have enough now unless I prove to myself that I will use them more. I do have a huge PTI order coming it's taken 5 weeks to get, I have forgotten what I ordered. well isn't that just the sweetest thing, you've done a great job the background is also great. have a great week-end, catch up with that order soon. Wow, you are getting really good with those copics! Great job! I still haven't done the digi thing yet! Not sure what I'm waiting for!